For all the trials, tribulations and tearing my hair out, I don’t half get to do some cool things courtesy of my job. I’ve visited Auschwitz, I’ve seen one of my favourite bands Ash play… in Ash and I’ve set a hot lap at the Top Gear test track. 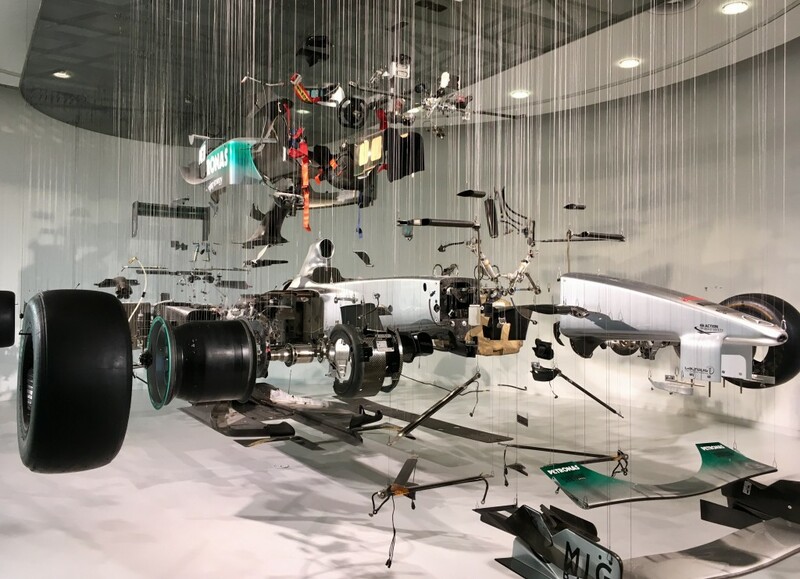 So it was with no second invitation I gamely joined colleague Tom Smurthwaite at Mercedes-Benz World to meet a rather special guest – that’s him at the top, the bloke in the white top looking 7,373,245x cooler than us two numpties. Yes, on Thursday, we got to spend an afternoon at Brooklands – and a few fraught minutes with former McLaren driver, three times F1 champion and all round nice bloke Lewis Hamilton. 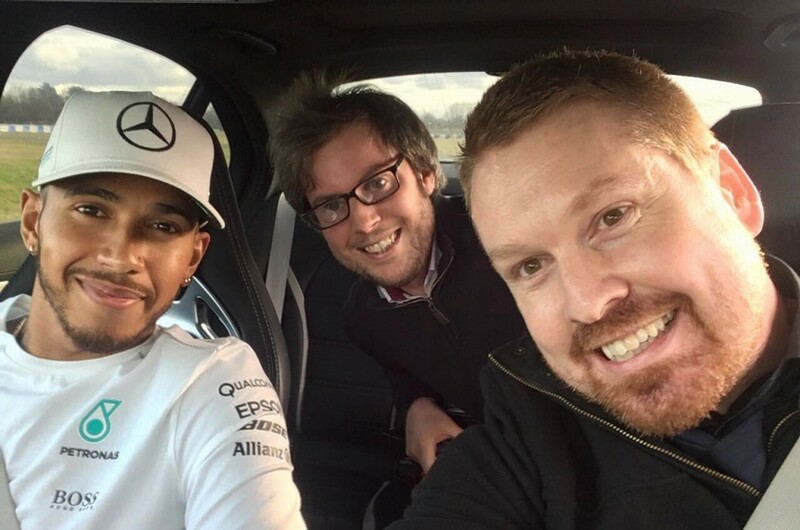 Lewis thrashed us around the Brooklands test track while we tried to lob a few questions in his direction – and keep our lunches down. Easier said than done. So what, I hear you ask, did we establish? Well, Lewis has been impressed with new Mercedes teammate Valtteri Bottas’s performance, he’s looking forward to the new season and the 2017 rule changes, and our little sortie at Brooklands, when Lewis was (so far as we were concerned) absolutely nailing it, was the small matter of ‘about 5%’ of what he experiences in F1. Eeesh. “Any plans to move here [Surrey]?” quipped Tom. “Nope. It’s the weather – it’s freakin’ cold! Maybe in the future though, when things settle down,” said Lewis. We also had a quick nose round Mercedes-Benz World itself, which is a pretty incredible place too. Besides all the track experiences, the centre is, well, as shrine to all things Mercedes, on and off the track. It’s free all year round so you can drop in when you like. They even show the races live on Sundays in the building’s two cinemas – again, completely free. 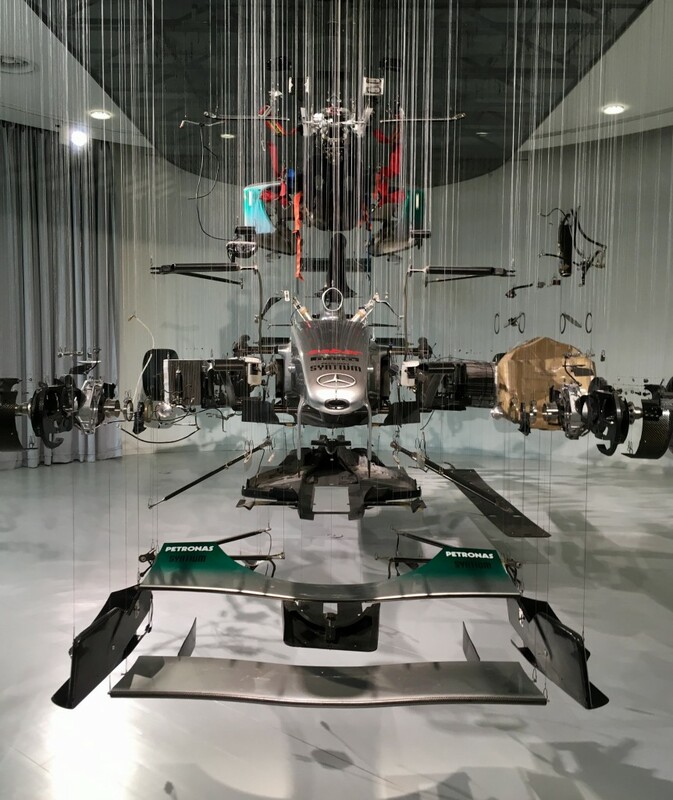 There’s even an exploded F1 car – 3,200 components carefully and meticulously strung up from the rafters. 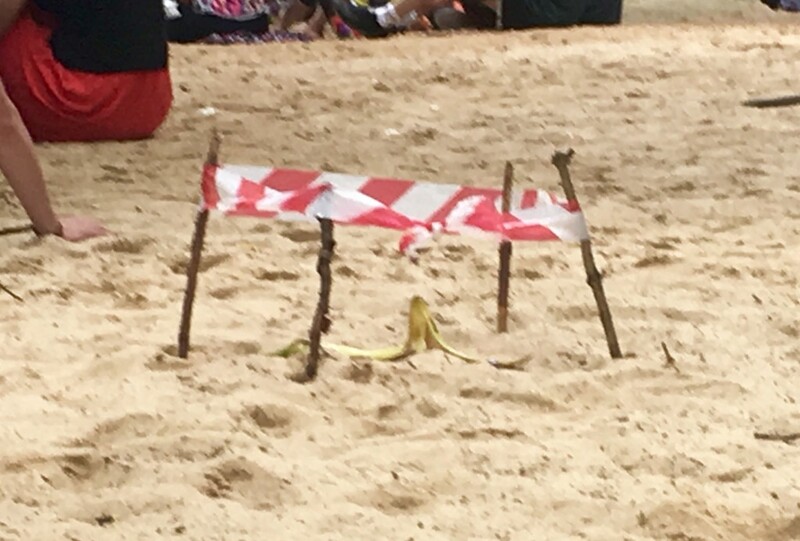 It took three months to make. If you’re an F1 fan, it’s kind of awe-inspiring, it must be said. You can see our full video package from Brooklands over at Get Surrey. So it’s 2017, at last. Let’s not eulogise about 2016 – Bowie, Brexit, Trump, etc. In the grand scheme of things, it was grim. For me, it was a beige, meh, 6.5/10. Introspection’s never been my forté. What’s done is done, what’s not done is left to do. We move on. If I dare tempt fate (and I do), there is cause for positivity in 2017, putting the inexorable march towards Brexit aside. 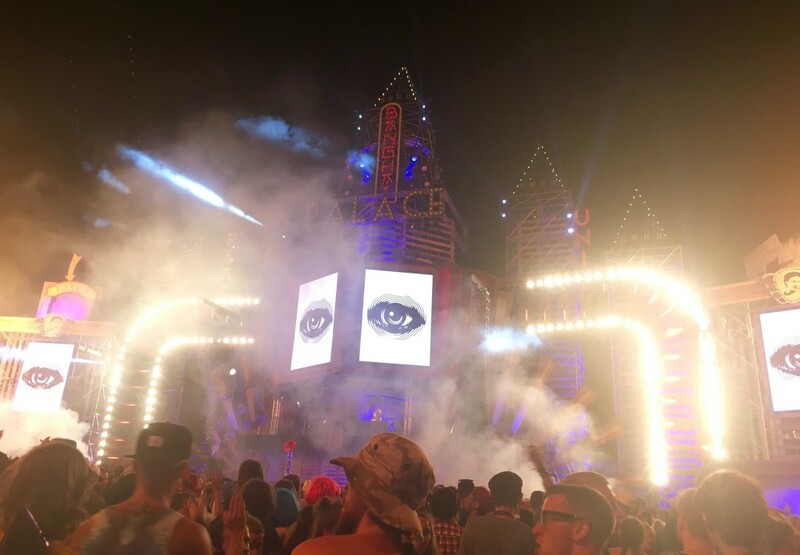 But first, a quick squizz through 2016 from this mawkish commentator, yours truly. The best thing I listened to last year was White by Weezer, quite possibly the best comeback album of all time and one that should rightly take its place alongside their 1994 classic Blue. It is, quite simply, flawless. If the Beach Boys were at their prolific best in 2016, this is the album they would have written. Honourable mentions include Skeleton Tree by Nick Cave, Give A Glimpse Of What Yer Not by Dinosaur Jr, Hardwired… To Self Destruct by Metallica, A Moon Shaped Pool by Radiohead, Music For An Infinite Universe by 65daysofstatic and, of course, Blackstar by David Bowie. The best things I watched last year were Hail, Caesar! and 10 Cloverfield Lane, although that’s just about it for 2016 films I actually saw. Moved to London, specifically Tooting. It has been excellent. 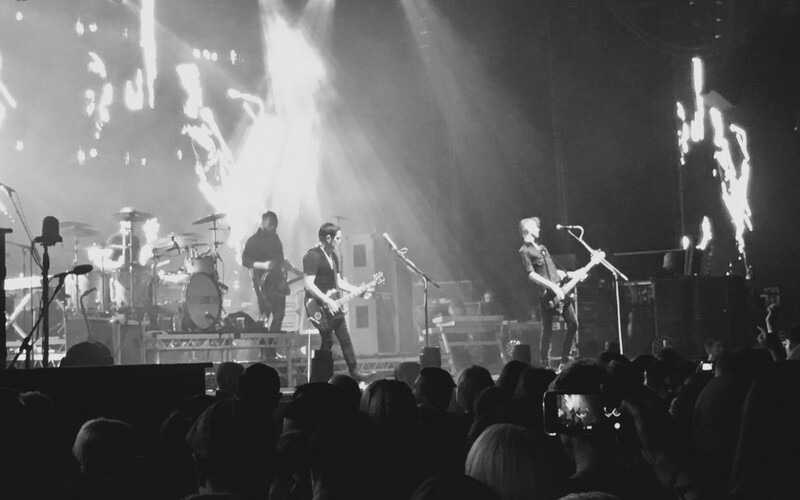 Finally saw Placebo after some 15 years waiting – and it was totally great too. 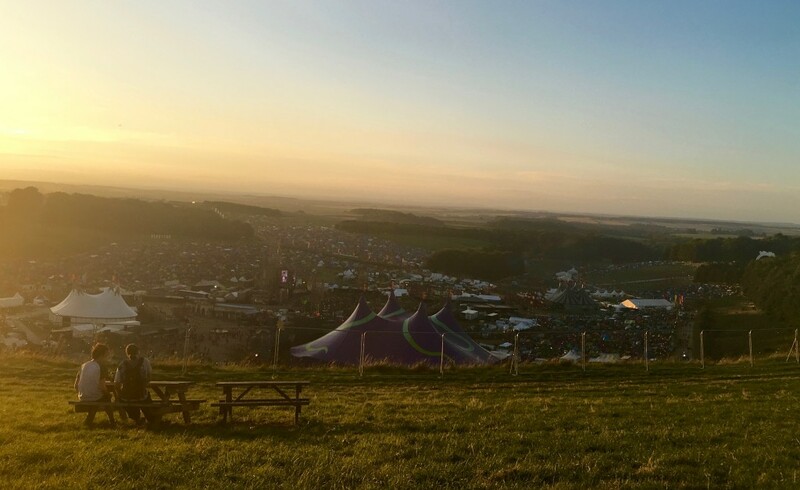 Saw and reviewed Bowling For Soup (yes, really), Band Of Skulls (magnificent), We Are Scientists (nostalgic), The Stranglers (business as usual) and scratched my festival itch at BoomTown Fair and The Boileroom’s Always The Sun in Guildford. Also caught some of my favourite bands – Dinosaur Jr, 65daysofstatic, Alien Ant Farm performing ANThology in full and Weezer. I went to Croatia and Turkey (more on these shortly), made my now (very nearly) annual pilgrimages to Westendorf in Austria and Snowdonia (and later Anglesey too). 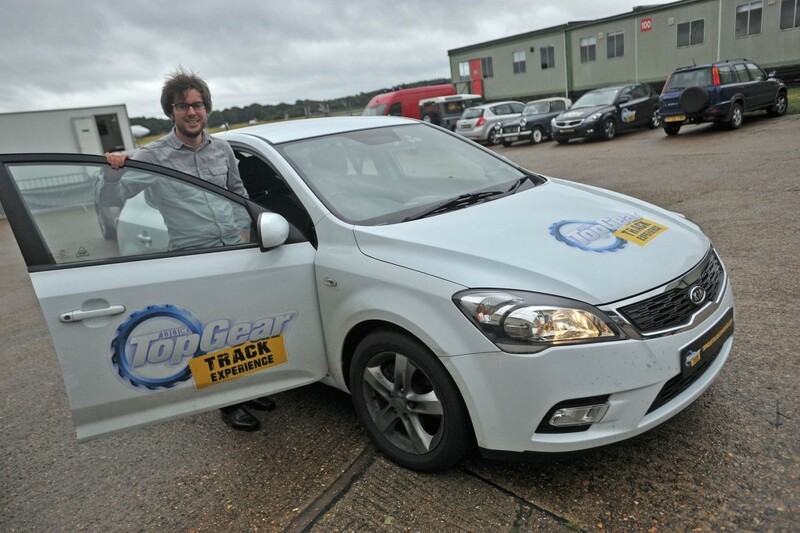 Became a Top Gear presenter for a day, posed by the Cool Wall and became the star in the reasonably priced car (hot lap of 1:52:17 on a very wet track). Finally visited Kingfield to see Woking FC fight for a spot in the third round of the FA Cup. Sadly, it wasn’t to be. Interviewed Rob Llewellyn, Chris Barrie and Hattie Hayridge of Red Dwarf fame at Guildford Comic-Con. Got caught up in the Pokemon Go craze, resulting in this Surrey Ad spread. Got caught up in the No Man’s Sky hype too, spawning this equally wonderful Surrey Ad spread. 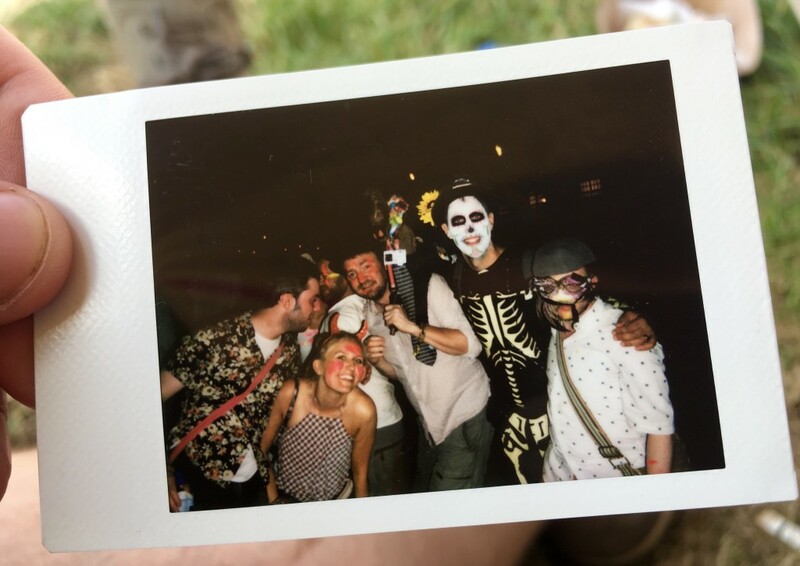 Saw Gaz Coombes and Primal Scream at a pretty mega stag do (and the wedding wasn’t half bad either, ofc – ta Drennie and Jrennie!). Did important journalism about what people in Surrey call wood lice. Et finalement, last year, I did a little round-up of those we sadly lost. This year, well, need I even remind you? I reckon it was circa 2001 I came home from school to my Nan’s house, flicked to Kerrang! or MTV2 and caught the tail end of Nancy Boy. She had Sky y’see, and that song was ALWAYS on. It’s hard to underestimate what an effect those few minutes viewing had on my taste and interest in music. I owe my appreciation for so many of my favourite bands to those snatched half hours I was allowed to watch whatever I wanted – imagine sitting your 70-something Nan down and showing her Break Stuff by Limp Bizkit. Well that was us 15 years ago. Hurr. Through Nancy Boy, Pure Morning and later, The Bitter End, Placebo got under my skin. In my 12/13-year-old innocence, I had absolutely no idea what Nancy Boy was all about – probably for the best. But sheesh, they aren’t half a frustrating, difficult band to love. For every stroke of brilliance, there are half a dozen stinkers, and then there is their famous reluctance to air the classics live. IIRC, Nancy Boy was mothballed for a decade at one stage. Wut? In fact, I think for many years, I actually had no desire whatsoever to see them live. I always have been a fairweather Placebo fan – their 2004 singles collection Once More With Feeling was (and remains) just about all the Placebo I need in my life, the notable exception being their utterly brilliant 2009 album Battle For The Sun. 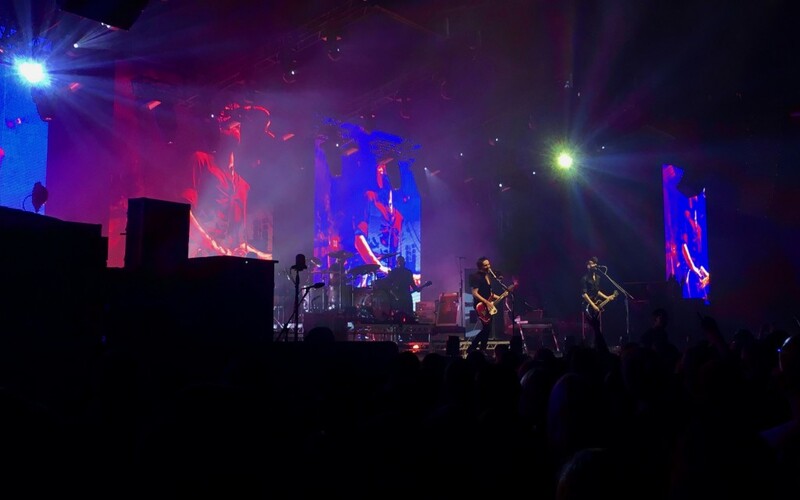 And then, 15 years in waiting, Placebo earlier this year announced a 20th anniversary tour promising all the hits for, in the 2016 ticket market, the bargain price of £27.50 – a tour which included an atypically dinky show in the grand scheme of things at the Brighton Centre. Omg. It came round sooner than expected actually (Wednesday night, to be precise), or perhaps that was just out of my longing for this absolute shitshow of a year to be over – something not lost on the band. The show opens with playback of Leonard Cohen’s Who By Fire while archive footage of David Bowie is laid over the visuals for Without You I’m Nothing. At the other end of the spectrum, the ghastly visage of Donald Trump is branded on a pack of cigs during one song, complete with health warning. Apt. 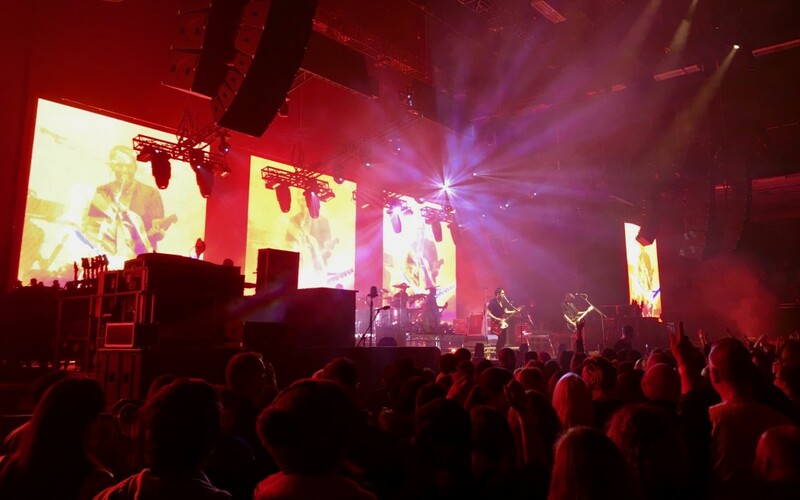 Brighton comes alive from the droning opening strums of Pure Morning, brought back especially for this tour after a nine-year absence from the band’s setlists (again, why?). No matter, it sounds a fresh as it did when it was released in 1998, Brian Molko’s vocal is spot on, and the lyrics are every bit as nonsensical as ever. The hulking two-and-a-quarter hour, career-spanning 25-song set navigates the band’s proudest and deepest melancholy cuts, culminating in a brutal version of 1996 debut album closer Lady Of The Flowers. “That’s the end of what we like to call the melancholy section tonight,” says Molko to cheers from the crowd. “Hah! People usually boo at that point,” he jokes, acutely aware of the band’s historically dark, brooding image, persona and, vitally, perception. Let us not forget the vitriol some reserve for Placebo; they are, to abuse a cliché, one of those ‘Marmite’ bands. Cue a raucous finalé – For What It’s Worth, Slave To The Wage, a bananas version of Special K, A Song To Say Goodbye and finally, my personal favourite (which totally did not disappoint), The Bitter End. And we breathe – briefly. Two encores ensure. Nancy Boy sends Brighton into raptures, while their now customary cover of Kate Bush classic Running Up That Hill is a fitting closing number. I was secretly hoping they’d dust off Taste In Men just for us, but it was not to be. It didn’t matter. I tried to sum up my thoughts in a tweet straight after the show. 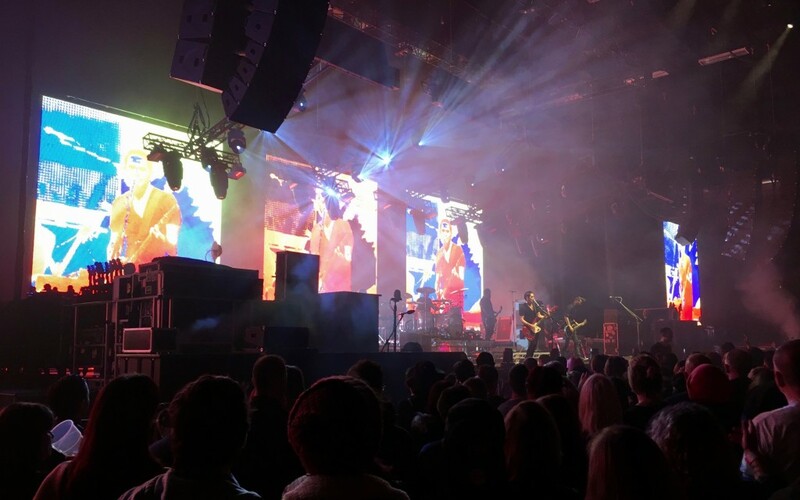 In short; this was every single bit the Placebo gig I’ve patiently waited the best part of the past 15 years for, ever since I saw Nancy Boy at my Nan’s house. Every great party needs a great soundtrack. And during the mid-noughties, We Are Scientists were THAT band. Following the success of 2005 LP With Love And Squalor, New York City’s indie also-rans were on every self-respecting night club playlist and on shuffle at every great student house party. Even if you somehow managed to avoid their charms, there was no escaping tracks like Nobody Move, Nobody Get Hurt and The Great Escape. More than 10 years hence and not a whole lot has changed, albeit those soaring heights the band once enjoyed are perhaps not what they were. Trading academies for clubs, We Are Scientists earlier this year announced a mammoth UK tour in support of sixth album Helter Seltzer. 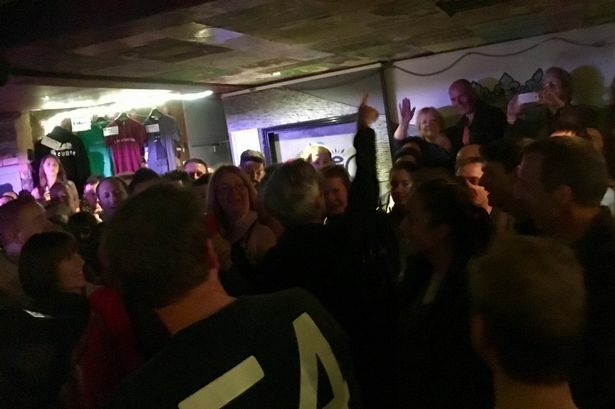 And after traversing the country from Glasgow to Gloucester, finishing up in Barrow-in-Furness of all places next month, Keith Murray and co rocked up at a sold-out Boileroom in Guildford on Sunday night. With his now trademark silver fringe still very much intact, singer and guitarist Murray, who still inexplicably looks about 15, along with bassist Chris Cain and drummer Keith Carne bound onto the venue’s cosy stage just after 8.30pm (it is Sunday, after all). 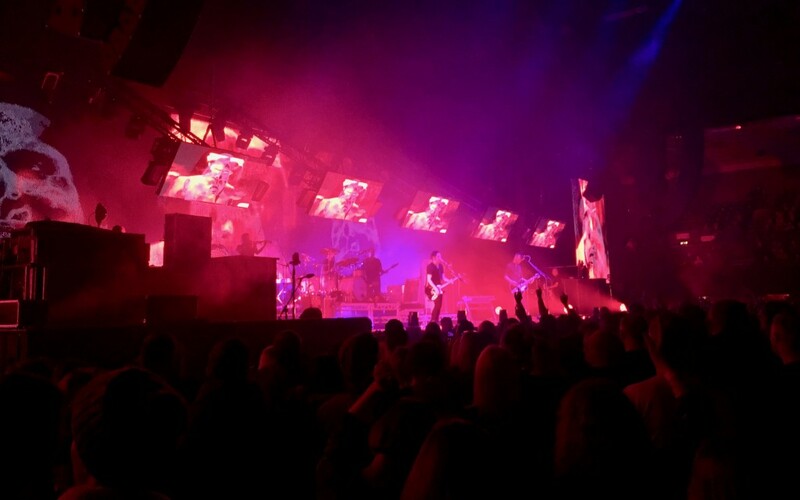 Both apt and somewhat ironic, opening number This Scene Is Dead sets the tone for the night – while the band tread some new ground, this tour is a celebration of their heyday. The crowd, packed with 20-somethings, greet them warmly, as you would an old friend you’ve not seen in a while. “Can you all just be silent please,” jokes Murray after the band’s uncharacteristically quiet and somewhat inauspicious opener has someone behind the scenes reaching for the volume knob. Sound levels fixed, the trio dip liberally into With Love during their hour-long set, which is also peppered with highlights from six LPs spanning nearly 15 years, including two cuts creamed from Helter Seltzer. Nobody Move has The Boileroom pulsing and mid-way through the set, Murray hands over his guitar to guest Joel Dilla and conducts the crowd from the barrier. Only then does he ease himself into the throng for a walkabout. Always with an ace up their sleeves, We Are Scientists marvel in being able to control the tempo of their set in a stroke. Slower songs are juxtaposed against the band’s more jangly moments while their stage patter is second to none. They even stop to play with their effects pedals for a bit, just because. The Great Escape, another stonewall mid-noughties earworm, rounds out the band’s main set heralding perhaps the most enthusiastic response of the night. Shapes are thrown. “I’ve got a great idea! I’ve got to wait right here!” bellows Murray, his every word echoed by The Boileroom faithful who bellow them straight back. Nice Guys and After Hours bring proceedings to a close. Respects are paid, hands are grasped in the front row, emotions run high. This has been a really special night for a whole lot of people. Is this scene dead? Probably. 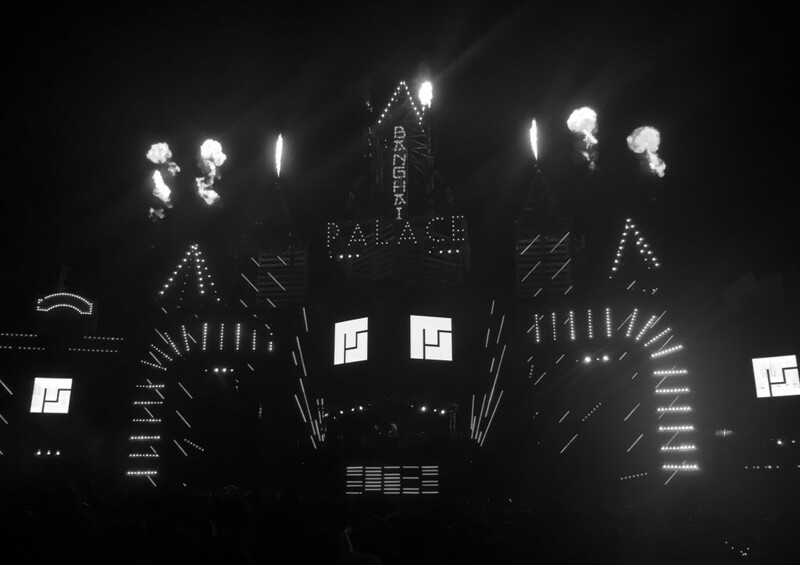 Do the memories live on? Definitely. 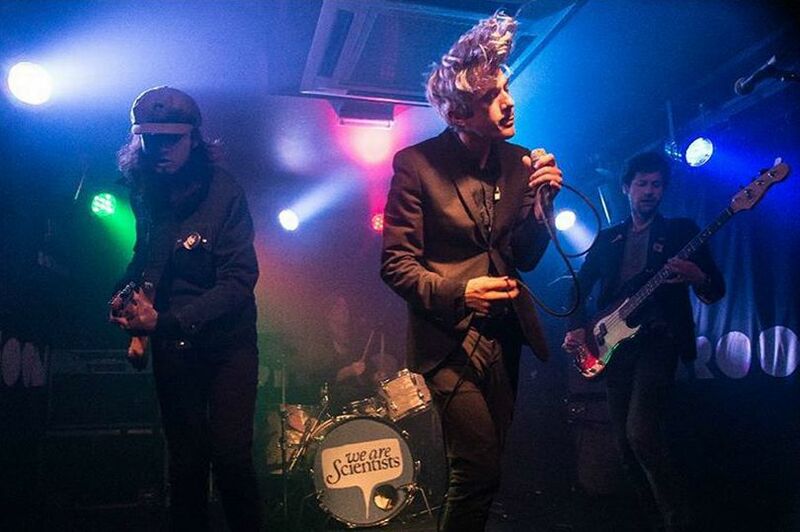 We Are Scientists will always occupy a special place in the hearts of a generation of indie kids. 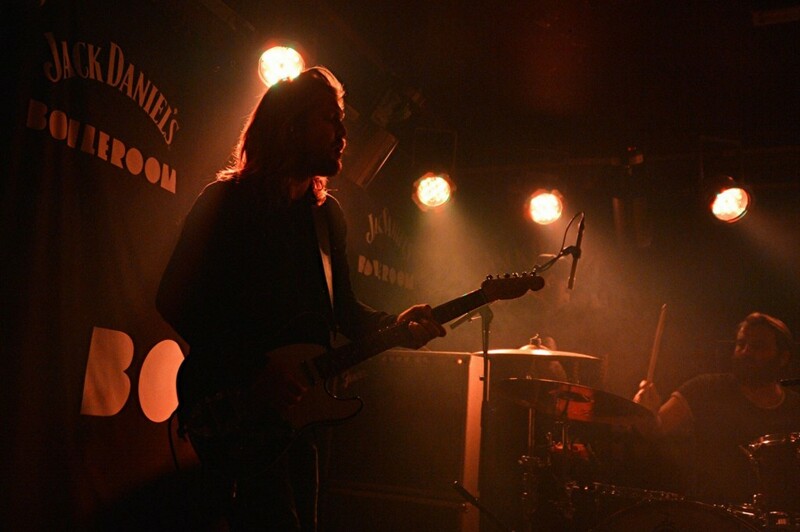 Sunday’s Boileroom show and the band’s huge UK tour serves only to affirm it. A little adventure, 19/08/16 to 21/08/16. North Wales has become something of an annual August pilgrimage now. Didn’t actually take many pics of note (mainly because I’ve taken bundles before) and because the weather was, frankly, a bit crap. 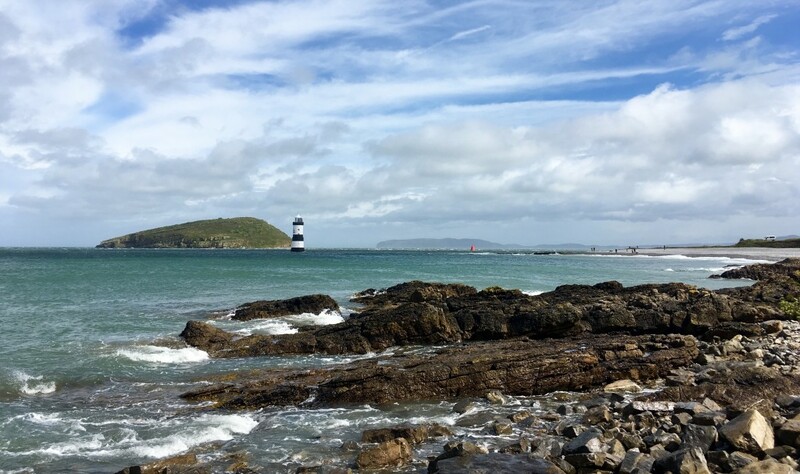 But it was a chance to visit Anglesey for the first time, which was as beautiful as you would expect, and where the clouds cleared just long enough for a nice shot. A little adventure, 11/08/16 to 14/08/16. 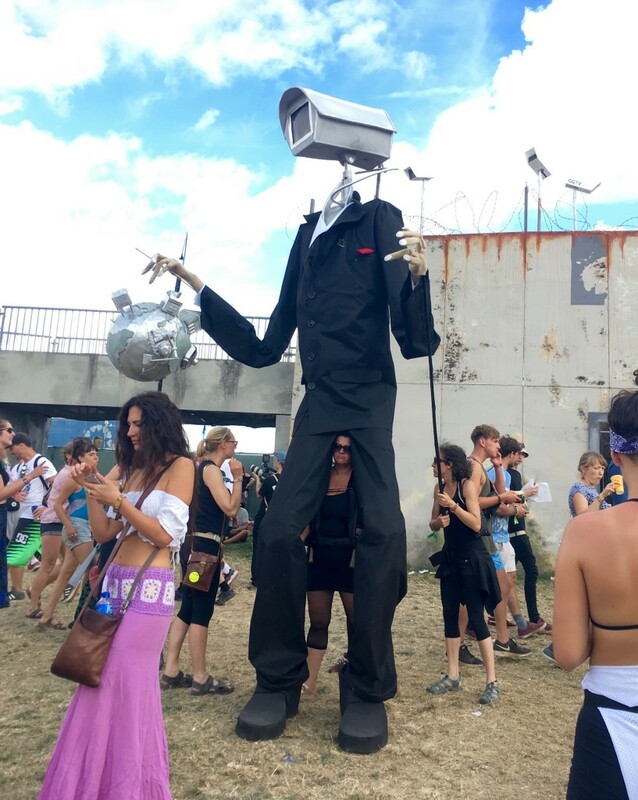 My second year at BoomTown (year one ici), made all the sweeter by the fact, A. I was/am covering it, and B. I didn’t have my wallet nicked on the first night. Musical highlights; Ozric Tentacles, Les Yeux D’la Tête, Craig Charles, The Destroyers, The Orb, The Correspondents, Alfresco Disco, Leftfield. Other highlights; Losing the plot while throwing some shapes at Robotika, Tribe of Frog and before the amazing Bang Hai Palace, meeting and getting a random polaroid with George the Festival Horse (with a special shout out to the chap who gave me his pair of kaleidoscopic glasses which utterly changed my life during Leftfield’s set), seeing justice dispensed in Wild West, and just because he was so good he deserves mentioning twice; CRAIG CHARLES. I mean, he even did a mash up of Man of Constant Sorrow. ‘Dat Rockt. Anyhoo, here are just a few of the best pics I took during the weekend. I’m no photographer, but I was chuffed with a few of these. Okay, that’s official the worst headline I’ve ever written. But nevermind. 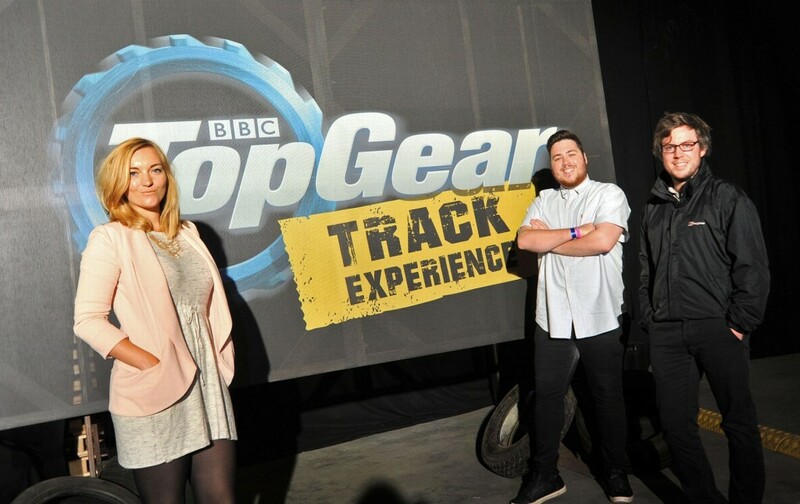 This week, me, and my Get Surrey colleagues Michael Pearson and Georgina Townshend, were revealed as the new hosts of Top Gear. Well, actually, no – not really. Let me explain. Top Gear has long been shot at Dunsfold Park, just a few minutes drive down the road from our office in Guildford. 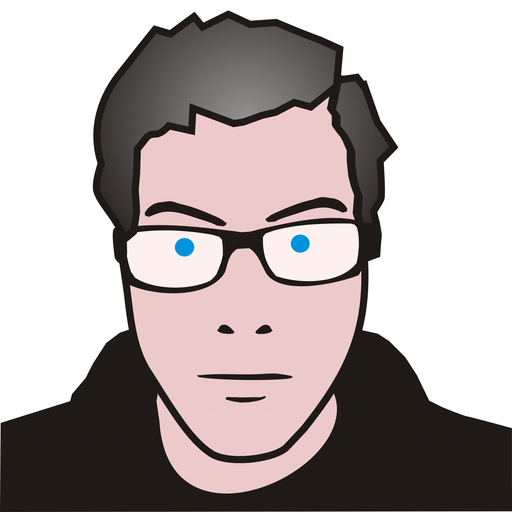 We loosely cover developments on the show, particlarly filming of the new-look shot post Clarkson, Hammond and May. And after a bit of badgering, the team down at Dunsfold Park were kind enough to invite us down to experience a bit of the Top Gear magic for ourselves, namely, an Ariel Atom driving experience for Michael while Georgie went out for a spin with The Stig. Me? 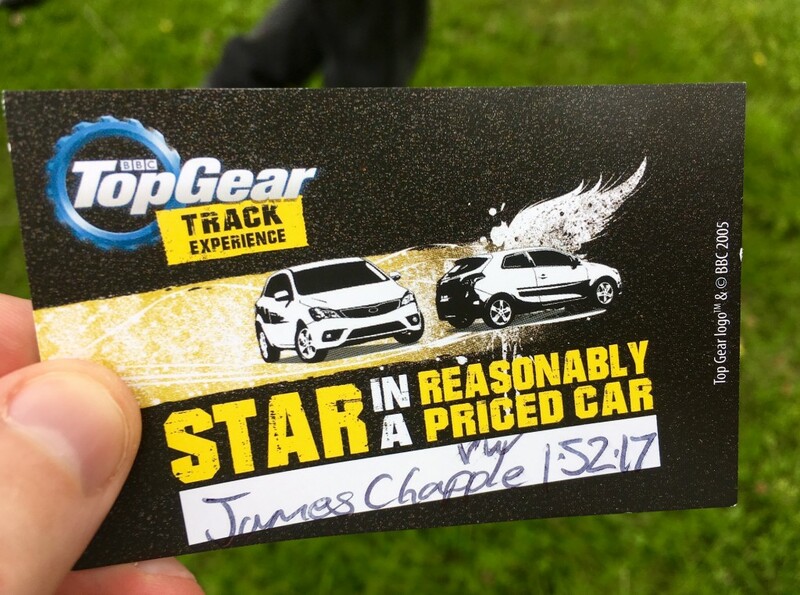 Well the honour fell to me to set a laptime on behalf of Get Surrey and become, for one lap only, the star in a reasonably priced car. 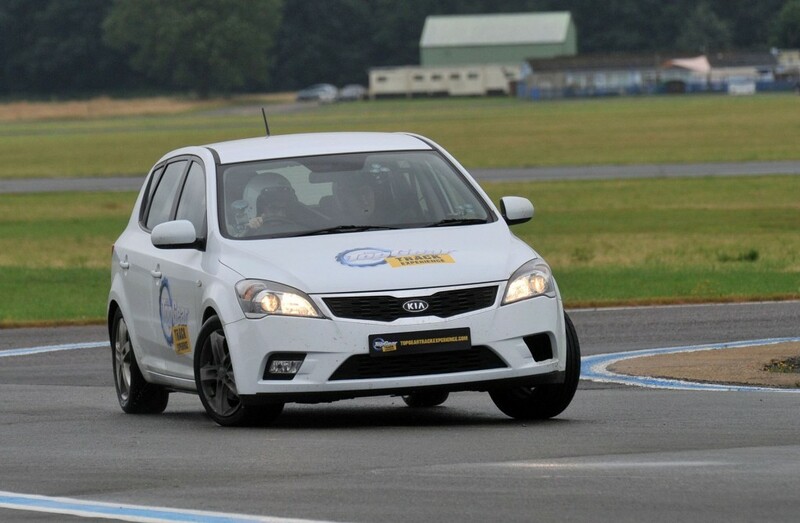 On what Clarkson and co might call a ‘mildly moist’ track, my instructor guided me round a practice lap in the track’s Kia Cee’d and with just that single lap under my belt, I gave it the beans. The result – a stirling, dare I say it so myself, 1:52:17 on what my instructor later upgrated to a ‘very wet’ track. Not bad, not bad at all. 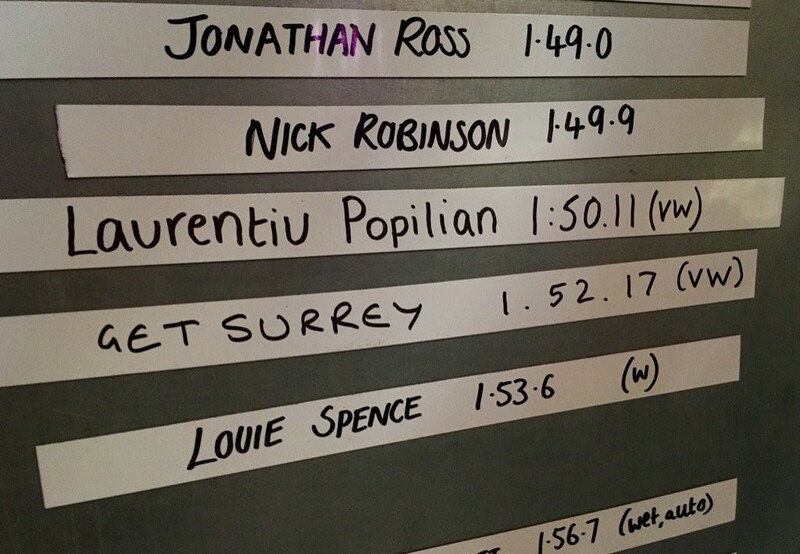 Get Surrey; slower than Jonathan Ross and Nick Robinson, but faster than Louie Spence. Bonza. 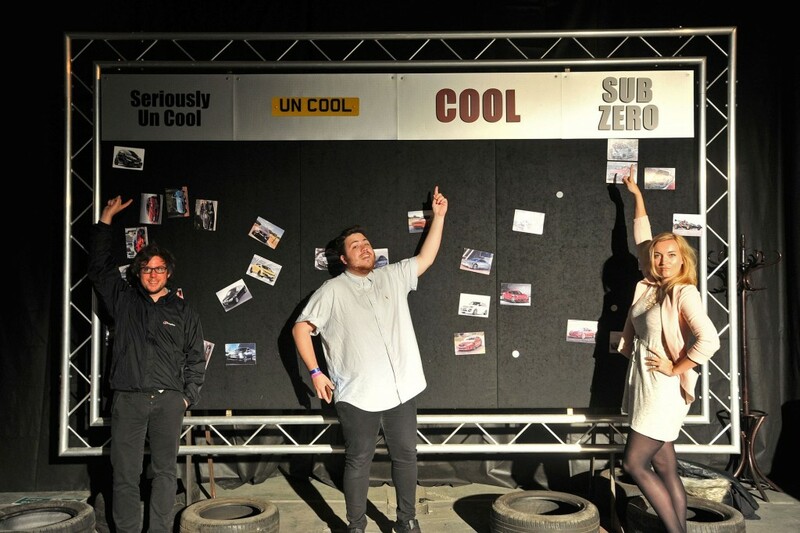 You can watch Get Surrey’s full episode of Top Gear here. Remember when the Arctic Monkeys came along and ‘saved’ guitar music back in 2005? No, me neither. In fact, I don’t recall there being a time, certainly in the early 00s, when it was ever in need of a saviour, especially after it allegedly was ‘saved’ only a few years earlier by The Libertines. I distinctly recall going to my Nan’s after school twice a week (she had Sky) and watching a seemingly endless conveyor belt of great guitar bands come and go. Kinesis, Hell Is For Heroes, Nine Black Alps, Brand New, Yourcodenameis:Milo, Serafin, Cave In, Amplifier, Oceansize, The Datsuns, InMe, Grand Volume, Idlewild, Million Dead, Slaves To Gravity, The Music, Death From Above 1979, Pure Reason Revolution, Zico Chain, Secret Machines, Sucioperro, The Vines. To name but a few of my favourites. Hell, I’ll even chuck bands like Franz Ferdinand, Bloc Party, Interpol, Editors, The Strokes, Kings Of Leon and The Sunshine Underground in the mix too, at the more commercially acceptable end of the spectrum in that ‘alt-indie’ grey area. These were halcyon times. Two hours of MTV2 followed by Gonzo, before Zane Lowe became an insufferable sycophant, skivving off school of an afternoon to skim through albums I had literally no money for at Martian Records in Taunton (sadly now gone). I saw Million Dead perform an acoustic set there once. Oh what happened to you Frank Turner? But with the benefit of hindsight, you’d be forgiven for thinking the guitar, at least in mainstream circles, had been outlawed until Doherty, Barât, Turner and co got their mitts on one. 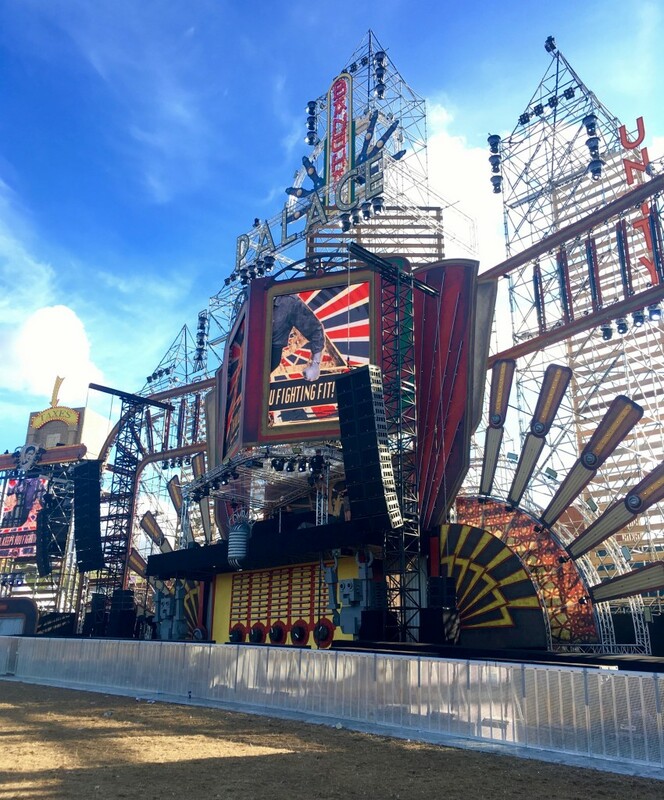 For all the column inches devoted to the Arctic Monkeys, they expertly rode the crest of an extremely popular wave, fuelled by the growth of social media. Their transition from My Space to Twitter and Facebook came at precisely the right time. 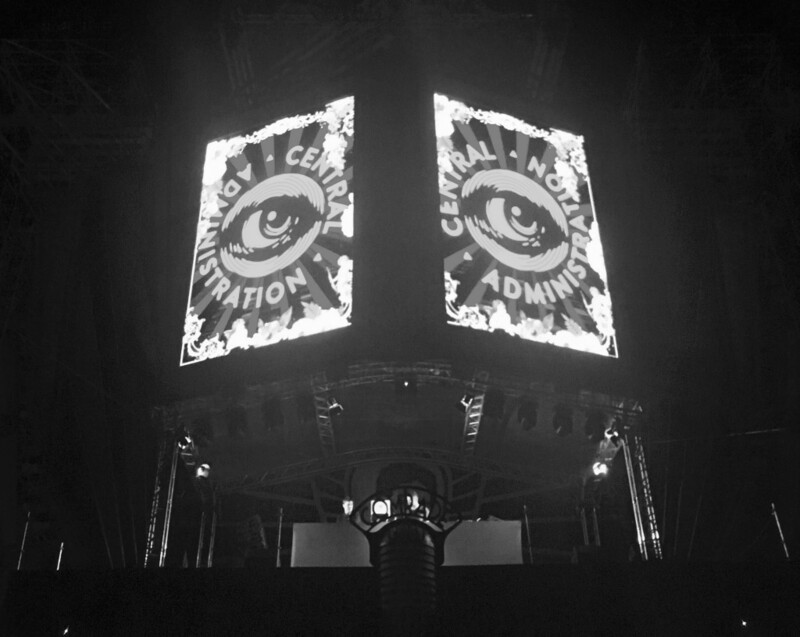 Suddenly, they commanded an audience unlike any before – one (literally) at their fingertips. It’s hard to overstate the effect social media had on music at that time. It was seismic. Sadly, for all those acts that came before though, they created a scene that was doomed, not to failure, but to obscurity. There were flashes. 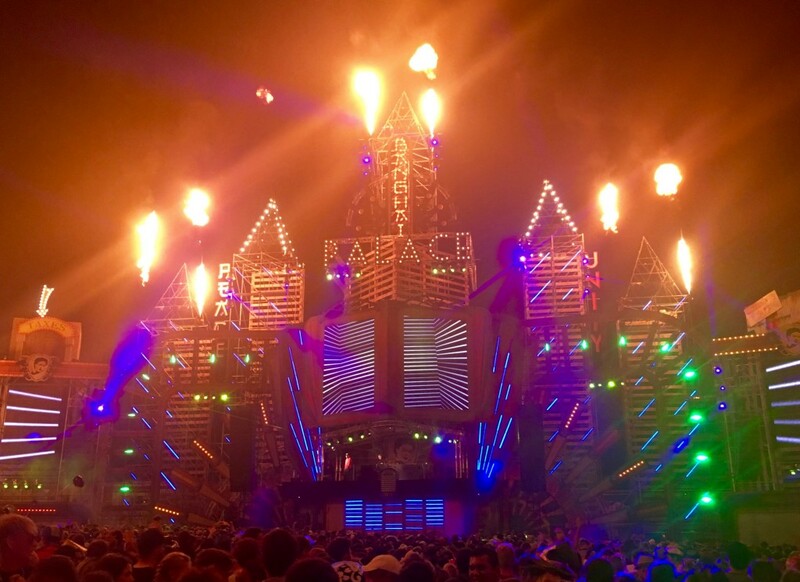 Get Free by The Vines was massive. So was Take The Long Road by The Music and Gloria by Brand New. I recall reading NME around that time too, blithely waxing and waning as popular opinion shifted. That said, had it not been for NME (even in spite of its endless Libertines cover features), I would never have discovered just about my favourite band of all time – Amplifier. It’s remarkable in retrospect they even got the half column they did in some end of year ‘riff round-up’. The song was The Consultancy if you were wondering. Go listen to it. It sounds like a guitar turning itself inside out. Nostalgia’s an unhealthy obsession, especially when you’re still only in your mid-20s, but hearing Crushed Like Fruit by InMe will always transport me back to my Nan’s living room. Actually, guitar music is still going great guns right now. 10 years later, the mantle has been assumed by Arcane Roots, Baroness, Marmozets, Battles, Black Peaks, Brontide, Future Of The Left, Drenge, Wolf Alice, Foals, Royal Blood, Vennart, Pulled Apart By Horses, Tame Impala, Turbowolf. Go. Listen. Devour. Unmistakably influenced by Matt Bellamy of Muse’s guitar histrionics, This Dead End is over-the-top in every way, from the absolutely filthy distortion on the guitars to the ridiculous solo and enormous chorus. Two and a half minutes of sheer unrelenting fury, propelled by a riff that could splice through universes. Very much a song to listen to first thing in the morning. 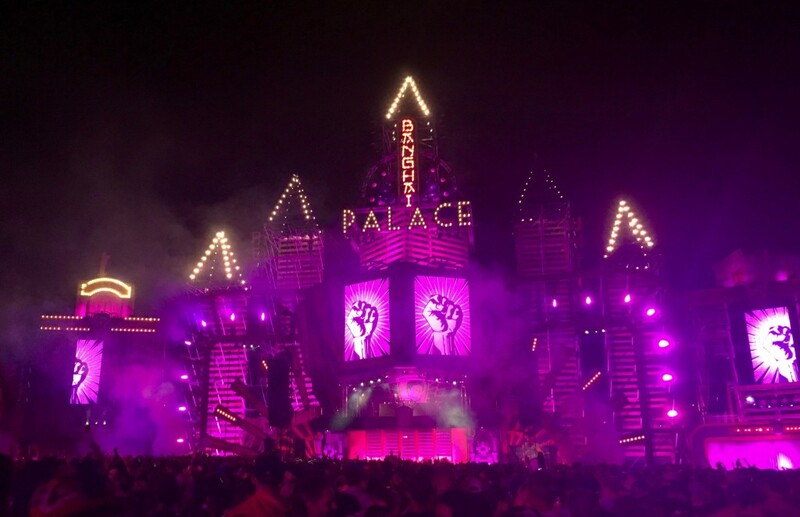 The Dance sets the tone for The Music’s self-titled debut. Swirling, psychedelic waves of guitar build and build and build into rhythmic motifs thanks to one of the tightest rhythm sections you’ll ever hear. Oh, and the ending is somewhere approaching what I’d expect the end of the world to sound like. 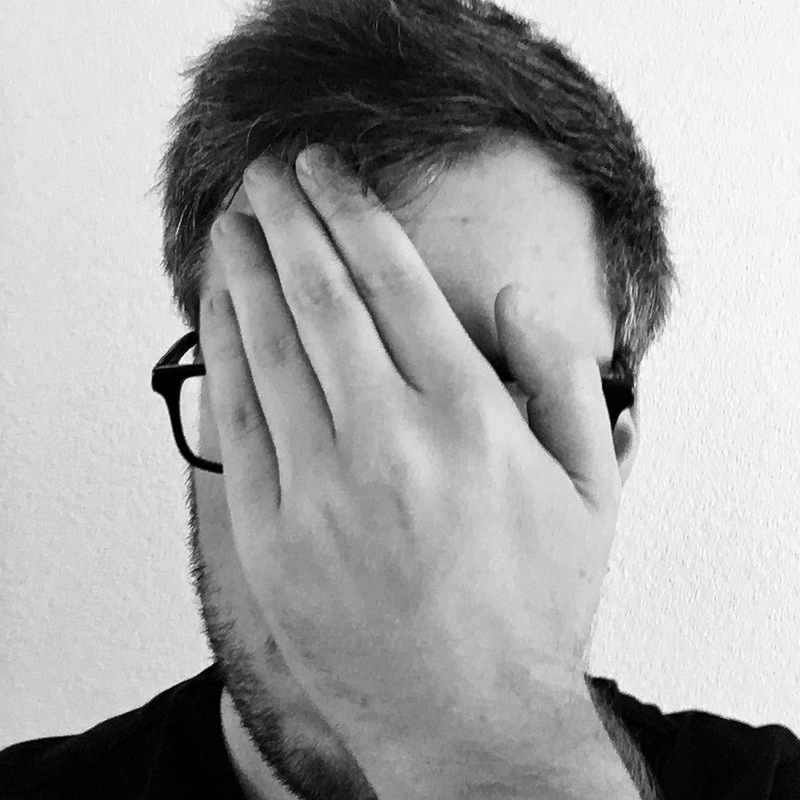 Another band clearly influenced by Origin-era Muse, Underdose is built around a simple riff that is as jaunty as it is buccaneering, while a then teenage Dave McPherson switches effortlessly from his impossibly deep teenage roar to cut-glass falsetto. I saw Secret Machines on a boat in Bristol. They closed with this track. A 10-minute twisted mélange of blues, rock and roll and psychedelia. For a song with just one distinct beat or groove, 10 minutes has never felt so short. We couldn’t stop idly strumming that very beat for weeks. Like the aforementioned A Modern Way Of Letting Go by Idlewild, Anchor is a three-minute relentless assault on the senses. There is no break, no let up, no flab. Just a barely contained wall of noise with a chorus to die for. It had to be this or Ironside. Not Everyone though features Nine Black Alps singer Sam Forrest at his most ferocious. With more than a nod to Nirvana, Not Everyone channels the angst of every 20-something outcast. This is by no means my favourite Amplifier song – but it is the song that perhaps had the greatest impact on my taste in music at the time. I was a huge Muse fan back then (when they were at their peak) but The Consultancy was the first song I heard around that time that gave me the same thrill as when I first heard the riff in New Born. It was just SO big. Again, by no means my favourite Oceansize song. However, when those squally wails of guitar give way to that interlocking riff (which pans left to right if you listen to it on headphones) and finally explodes into another cataclysmic riff, Catalyst becomes simply mesmerising. Today, a lot of people are saying they’ve ‘got their country back’; I really can’t help but feel that I’ve lost mine. On Thursday, the UK voted by a small majority to leave the European Union. The final result was around 52% to 48% in favour of leave. The leave vote was mainly concentrated among older generations. The ‘youth’, myself included, voted to remain. <insert Steve Buscemi ‘kids’ meme here>. I’ve long said I identify first and foremost as someone from Somerset. I’m proud of my county, its culture, heritage and parochial chutzpah. Oh, and the cider. But that only goes so far. Beyond our borders, I am not an Englishman or a Brit, I am a European, I identify as a citizen of Europe. The EU is a remarkable union, the biggest and most successful political and economic union the world has ever seen, one that has largely ensured peace in Europe for more than 70 years. Of course, it’s not perfect; nothing is. But I feel the frustration that has led to this decision has been misdirected. People went to the polls yesterday to give politics (and politicians) a kicking. I don’t blame them. But the EU was the wrong target for this frustration. The EU hasn’t ground the NHS into the dust. The EU hasn’t failed to build sufficient housing to meet demand and the new schools we need. The EU didn’t fail to chase corrupt firms for their billions in unpaid taxes (which, you know, could have fixed the NHS in a heartbeat). The EU hasn’t persisted with a voting system where millions of votes are, in essence, worthless. The ills this country bear are firmly rooted in Westminster, at the very heart of our parliamentary democracy, not Brussels. I’m 27. Just. It is my generation who will live with the consequences of this vote, a vote which was decided by two generations unlikely to feel the shockwaves. Generation millenial will live longer than any generation to date. We will retire later than any generation to date – and we will pay the most to support, sustain and care for the generation that sealed this vote. There is one positive though. Thursday was the day the ‘youth’ of this country woke up and sent a very clear message to our government. Some 70% of young people voted to remain in the EU, a huge (albeit ultimately worthless) mandate and one future governments will need to be wary of – and will need to appease. We are the future of this country, and we did not vote for this. UPDATE (3.30pm): These two quotes have been doing the rounds today in various think-pieces and on social media. I don’t know who said/wrote them, I don’t even know if they are attributable to a real person, but they sum up my feelings fairly succinctly. Note: I am sure there are many conscientous, forward-thinking, reasonable members of my parents’ baby boomer generation just as disappointed as I am with the result of the referendum. But the numbers stack up. Sorry. 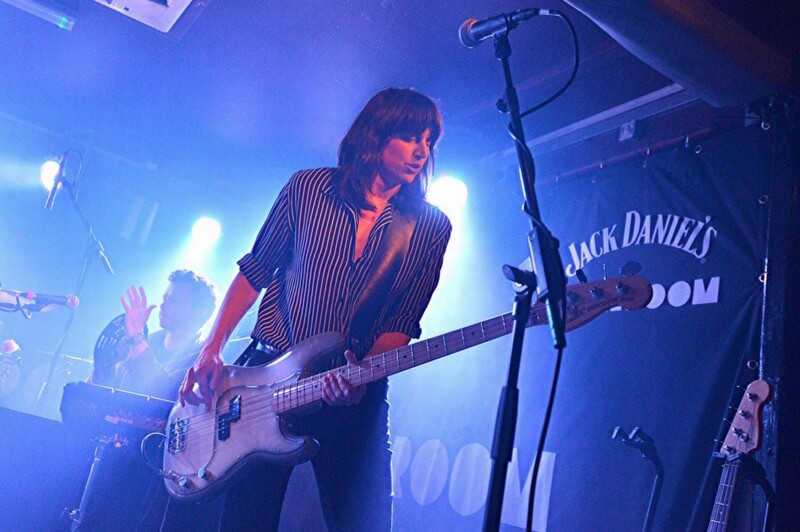 “This is the start of a new era,” says Band of Skulls frontman Russell Marsden. It’s Thursday night at The Boileroom and Guildford’s getting loose. It feels like a Friday – this is going to be good. 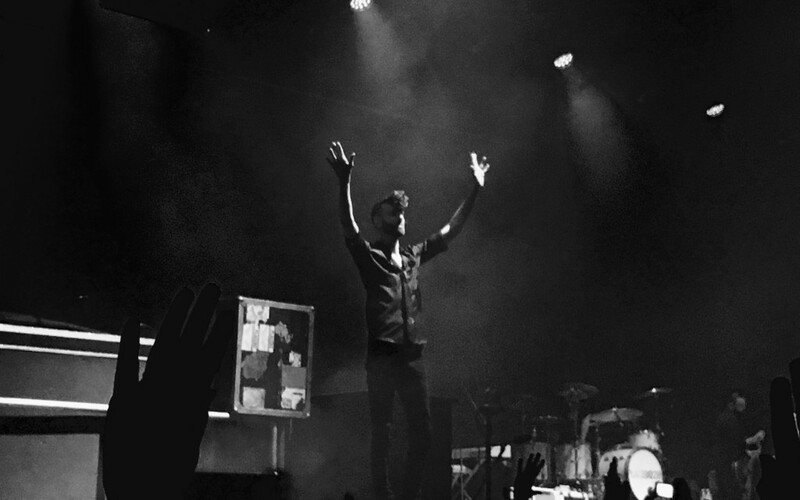 Up on stage though, things are far from loose. Band of Skulls’ mercilessly tight grooves mingle with all the ferocity of Queens Of The Stone Age yet the simplicity of AC/DC. Notes are never spare, stray or squandered, beats are as prickly as they punchy – “on point”, one might say. 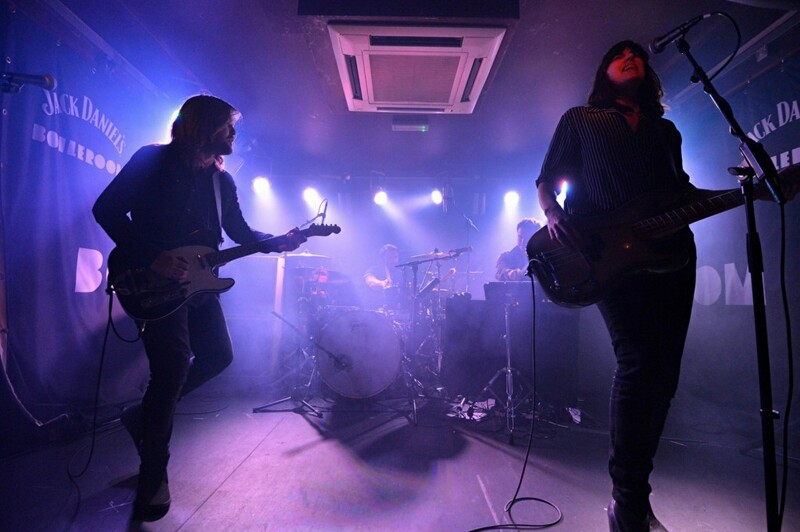 It’s all the more remarkable then this is the very first night of Band of Skulls’ “new era”. LP4 “By Default” drops on May 27 and tonight’s typically intimate, sweaty show at The Boileroom is, unsurprisingly, a sell-out. This is a band both used to, and destined to continue, selling out considerably bigger venues, a band for whom critical acclaim was never lavished, but hard-earned – and richly deserved. “We’re going to try and play as much as we can for you guys,” chimes Marsden, a broad smile on his face, only partially masked by his immaculately straight brown hair. The band, completed by bassist Emma Richardson and drummer Matt Hayward, visibly itch to cut straight to the new material they’re clearly so eager to share. They waste no time in doing so. Title track of sorts, In Love by Default, builds slowly but logically from small flecks of reverb-soaked guitar to a thunderous, wailing refrain driven by Richardson’s yelps of “Yeah, Yeah, YEAH!”, The Boileroom all the while bathed in stark blue light. Album opener Black Magic, by comparison, is a gloriously straight-forward affair, a bruising stomper and bona fide fan favourite in the making. This is gutsy blues fare, picking up from where the likes of The Black Keys lost their way and Tame Impala deviated. In total, the band air seven of By Default’s 12 tracks. The songs are rough, ready and raw, not yet weary from months on the road. Perhaps the most immediate of them is Killer, the first official release from By Default. It’s a dirty number, propelled by Marsden and Richardson’s interlocking fretwork and a vitriolic chorus of “Killer, Killer, KILLER!”. The crowd have done their homework though; they holler every word straight back at the band. One punter, meanwhile, repeatedly asks Richardson to marry him – he gets a smile and a raised fist in his direction. Old favourites punctuate the band’s hour-long set. Ikwia gives Marsden a chance to show off his chops while Sweet Sour brings to mind Angus Young in all his schoolboy pomp. 2014’s “Himalayan” is represented by its eponymous title track and the gonzo Hoochie Coochie, an oh-so brief flashback to Wolfmother’s cocksure schtick. Vocal duties flit between Marsden and Richardson, save for those rare moments when they come together in effortless harmony – to great effect. Light of the Morning and Diamonds and Pearls bring the band’s main set to a ringing crescendo, the latter complete with one brave crowd surfer writhing atop the seething melée on the floor, steadying himself with a reassuring hand on the ceiling. 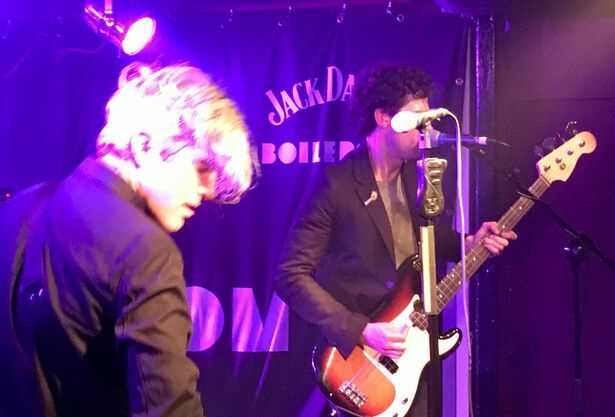 As ever, The Boileroom’s “encore problem” is as quaint and endearing as it is bemusing, if only because it makes such delightful mockery of the ludicrous idea an encore in 2016 is any more spontaneous than it is an expectation. First up is the aforementioned Killer, but the absolutely bonkers Asleep at the Wheel is a more fitting finale, its frequent and dramatic changes of tempo serving only to further accentuate Marsden’s bellowed refrain of “Cause where we are going is anyone’s guess!”. With one final flurry of riffs, the trio are done. 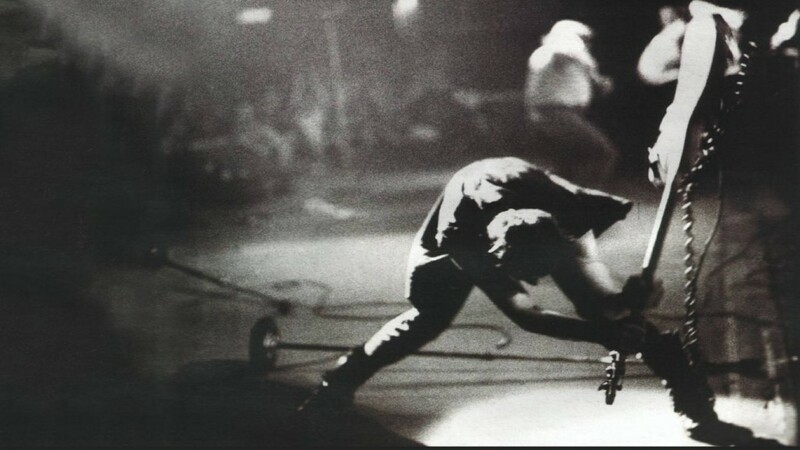 Marsden strides to the front of the stage and presses himself up against the barrier, proffering his guitar to the audience in recognition of their spirit. One can only hope it has been as memorable a return for the band as it has been a welcome one for their flock. Originally published on Get Surrey, 29/04/16.